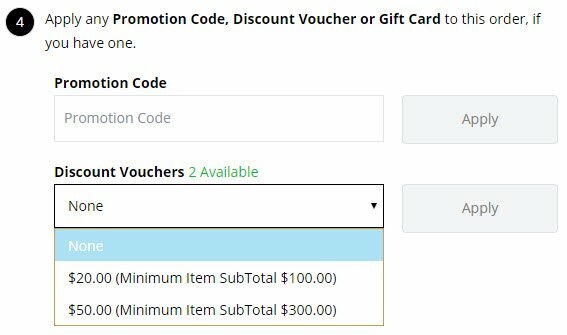 How do I obtain a Discount Voucher? Discount Vouchers are provided to Members at Hare & Forbes Machineryhouse's discretion. They may be published in various forms of media like, radio, television, print, online, email etc. at Hare & Forbes Machineryhouse's discretion. For all Discount Voucher - Terms & Conditions. Where do I select my Discount Voucher at Checkout? In Step 3 in the Secure checkout page if you go down the page to Step 4 you will see "Discount Vouchers" drop down. Select the Discount Voucher here if available and this will effectively discount the order. Example shown below.